Welcome to British Isles Friday! British Isles Friday is a weekly event for sharing all things British — reviews, photos, opinions, trip reports, guides, links, resources, personal stories, interviews, and research posts. Join us each Friday to link your British-themed content and to see what others have to share. The link list is at the bottom of this post. Last week’s collection of posts included photos from London and Cornwall, book reviews, and humor. A new blogger joined us, Mark Baker of Carstairs Considers…. reviewed a book from a mystery series centered around a hat shop in London. Fun! 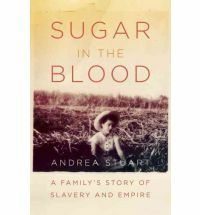 For my post today, I’m reviewing Sugar in the Blood by Andrea Stuart. This is the second time in a row that the selection for the Diversity Book Club also worked for British Isles Friday. Last month, our selection was TransAtlantic by Colum McCann. Summary: Generations of Andrea Stuart’s ancestors lived and died on the Caribbean island of Barbados. They came from England and they came from unknown lands in Africa. They owned slaves or were enslaved. They came to Barbados by choice to seek greater opportunity or by force to be the means for creating that opportunity. For generations, the cultivation of sugar was the economic engine that drove the work and culture on the island with impacts that were felt far beyond — including England and the rest of the British colonies, like the thirteen that eventually became the United States. When Americans tell the story of slavery to ourselves, we tend to make it a story about the US, leaving Europe and Britain out as lesser players, somehow. But slavery was established in the New World for some three-hundred and sixty years and the US only existed for the last four-score and seven of them. Barbados was important not because it was the first society with slaves, but because it was the first slave society in the British Americas: that is, it was the first society that was entirely organized around its slave system and, as such, it would be come the model for the plantation system throughout the Americas…..Its political structure as well as its system of governance was organized around the control and management of an enslaved majority, while the moral, ethical and ideological values of the society were entirely developed and shaped to reproduce the system of slavery. p. 83. Sugar in the Blood describes the British involvement in slavery by focusing on Stuart’s ancestors, black and white, on the island of Barbados. Thoughts: Barbados was the proving ground for the plantation structures that underpinned slavery and were eventually exported to the American South. In 1661, Barbados enacted a law “For the Better Ordering and Governing of Negroes” that became model legislation throughout the British Americas. Comparable codes set up by the French and Spanish were much more “liberal” in granting certain rights of personhood to the enslaved. Barbadians helped invent the concept of whiteness and blackness, making race a defining characteristic of slavery. By the 1660s, while England recovered its monarch and London dealt with fire and plague, Barbados became the star of the empire, leading the overseas trade, creating jobs in the mother country, and providing sugar for use and export. That passage took my thoughts in two directions, one very negative and one a little more positive. On the more positive side, I wondered if a clear-eyed look at the past, seeing the evil but also recognizing that’s not what it looked like from the angle of Robert Cooper Ashby, presents a path to healing. As I felt after reading Before the Mayflower in the fall, I sense an invitation in this book to accept both the slave owners and the enslaved women and men as our shared history, grim as it was. From that acceptance, can spring a more united sense of history that, I hope, can lead to a more inclusive future. Appeal: Sugar in the Blood is a remarkable book — readable but dense, weaving genealogy with history using documents, maps, and pictures to tell a story that has been ignored too long on both sides of the Atlantic. Reviews: I didn’t find any other book blogger reviews of this book. Andrea Stuart was interviewed widely when the book first came out — that’s how our book club heard about it. I’m surprised no one else picked it up. If you read Sugar in the Blood, let me know and I’ll link your review up here. Challenges: I’m counting this as my third book for the British History Reading Challenge, which means I met that goal of three books — but I think I’ll keep reading! Sugar in the Blood is also my ninth book for the Nonfiction Reading Challenge, putting me on track to read 16 books this year. *Mostly, I’m thinking about plastics here. It’s easier to imagine a modern world without cars than without plastic. I’m not talking about packaging — I’m thinking about all of the things we require for work — on my desk I have my laptop, ballpoint pens, a pencil sharpener, my headphones. And, just try to imagine a hospital without plastic. We need to be more inclusive, just as we need to see that we have not yet moved beyond the mindset that puts people into different “boxes” based on the color of their skin. I read Sugar in the Blood a few months ago while I was doing some research. It is a great book. I want to read her book on Josephine Bonaparte. My non-fiction British Isles link this week is a review of a wonderful book I read several years ago called ‘The Perfect Summer: Dancing into Shadow in 1911’ by Juliet Nicolson. It’s told through the eyes of several people living in London at a time of social change. I thought it was an absolutely fascinating read and I would definitely recommend it if you’re interested in that period of British history. Another great book review. I am finding echoes of my History of the Slave South class are definitely present in this book and the discussion of the commodities that drove the British to claw their way out of infighting and economic ruin through the forced labor and degradation of Africans. I picked this book up before from the library but never had a chance to read it. I need to change that. Your review is wonderful, Joy.